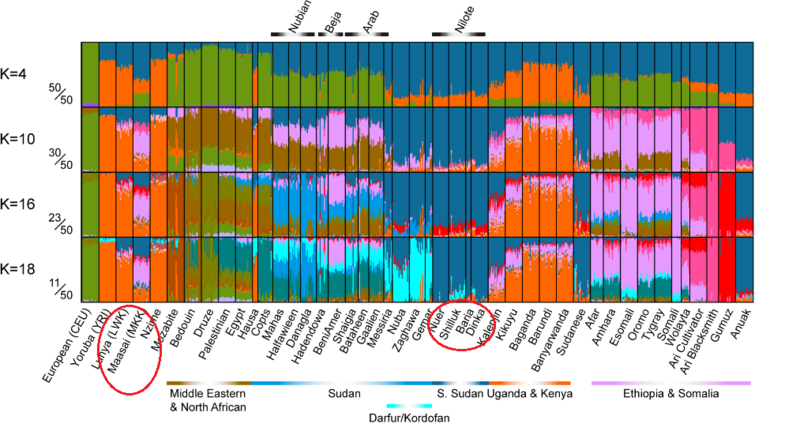 The Dinka/Nuer/Gumuz.. would've been a more preferable choice for a "Nilotic" aka "Ancient_East_African" component; this affinity is even non-negligible among SE-Mediterraneans, Levantines and other SW-Asians so it might be worth tweaking for these Eurasian testers. Last edited by NiloSaharan; 06-22-2018 at 07:27 PM. yes, but I’m limited to what I have in my data set, and more importantly marker overlap. To give you an example of 1 of the many problems I face with this calculator. The Baikal-HG samples onlly have 20 K overlapping markers at 150K markers. This means the tester’s genome is compared at only 15% of the positions. Thus Baikal doesn’t have a fighting chance with the other components. This can cause a few testers depending on the compant to get 98% Baikal where others from asimilar ethnic background get 1%. To circumvent those problems with Baikal, I would have to prune everything back to 20K SNPs. The problem with that is discrimination between closely related pops such as in the K45 is shot. The other alternative if Baikal is included would be to drop down to a K8 or so more ancient calculator. Thank you for the rundown Kurd, I appreciate you sharing these technical complexities -- I doubt the average laymen like myself would ever come across an explanation of these technical nuamces.